In seeking knowledge, we use our minds, but in seeking the true meaning of our lives, we must use our hearts. 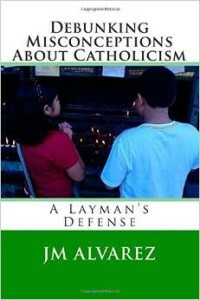 There are many books that defend the Catholic faith but most are ineffective in conveying God’s very simple message to the ordinary Catholic layman. Most members of the Catholic laity find catechisms complicated and hard to understand. Other Christian denominations are very aggressive in promoting their own doctrines and beliefs, challenging what most Catholics traditionally believe in. Recent surveys purportedly saying that many Catholics no longer want to go to church got it all extremely wrong! A Catholic knows that the beautiful center of his Christian life is receiving Jesus during the sacrament of the Holy Eucharist which Jesus Himself instituted, so how can he say that he no longer wants to go to the Sunday Mass? This book will debunk misconceptions of Catholics wrongly perceived as idol worshipers or celebrators of pagan traditions. It will try to answer in very simple layman’s terms the following controversial questions that even a fifth grader will understand: -Are there places called heaven, hell and purgatory? -Was Peter really the first Pope? -Why are there too many Hail Marys in the Holy Rosary? -The most Joyful Mystery: Was Jesus born on December 25? -Is Mary the Mother of God? -Can you find Darwin’s missing links in the Bible? -When will be the end of the world? -How can we love our enemies? How did Santa Claus get into the Christmas picture? -Did God create other universes? -What’s the missing link of all missing links? -Holy Trinity: How can The Father, Son and Holy Spirit be one? -How powerful are prayers? -How did the Church end up in Rome? -Can science prove that God exists? -Why are people afraid to confess their sins? -Why did the Crusades fail? -Do miracles really happen? -Can God hear our prayers at the same time? -What is the true meaning of love? -Is abortion murder? -Were the Three Kings really kings? -Was the Cross just a vertical stake or with a cross-beam? All the answers to these intriguing questions are simply explained using passages taken from the Holy Bible.